His first vintage was in 2000, just two barrels of chardonnay. It must have been an auspicious beginning, because, just a decade later, in the 2010 issue of Langton’s classification, the Savaterre chardonnay jumped into the distinguished category of emerging classics. As to the Savaterre name, it is the name of Smith’s father’s property in Chesapeake Bay in Virginia, USA – “a piece of low-lying swamp land”, he said. There is no similarity. Deep lemon colour. Creamy, leesy/yeast, hint buttery – not a fruit-based aroma, though some dry lemon toast notes on the palate, smooth, linear texture. Sweet-savoury yeast flavour going on in a serious and sophisticated, multi-layered wine. 13.5%. Pale cherry colour. Smoked cherry, savoury, smooth texture, dry spice and dry-sweet texture, savoury-sweet combo, delightful texture. Dark cherry fruit emerging, dry baked and layered. Texture is fine and refined. 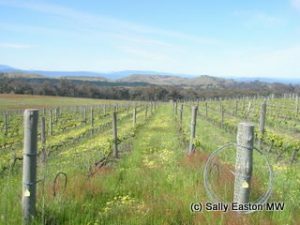 My research visit to Australia in October 2010 was sponsored by Wine Australia.